A state of emergency was declared in California's Santa Barbara County on Friday after a wildfire burning since Wednesday grew more than double in size overnight as it spread over the Santa Ynez Mountains. Threatening more than 100 homes and prompting mandatory evacuations, the so-called Sherpa Fire is raging across roughly 4,000 acres with only 5 percent of the blaze contained, Santa Barbara County officials said in a press conference Friday morning. Officials fear unpredictable sundowner winds triggered by a coming heat wave may cause the wildfire blazing across Santa Barbara County to grow even larger over the weekend. More than 1,200 firefighters were on the scene Friday working to tame the raging blaze, which began Wednesday afternoon near Refugio State Beach and Reagan Ranch and had consumed 1,200 acres as of Thursday night, according to facts provided by county officials. Although the cause of the fire is still under investigation, dry drought conditions and evening winds reaching up to 40 and 50 mph have reportedly helped drive the wildfire's rapid overnight growth. "It is ominous. We are concerned because the fuels out there are drought-stressed," Santa Barbara County Fire Department Chief Eric Peterson said, according to a report from local broadcaster KTLA. "There’s a lot of tree mortality out there that makes fire behavior worse. The drought is making an already pretty volatile situation not any better." Although crews have so far managed to divert flames away from homes, mandatory evacuation orders are in place for Refugio Canyon, Las Flores, Venadito, El Capitan Campground, El Capitan Canyon, El Capitan Ranch, and Refugio Campground with warnings issued for anyone residing in areas from El Capitan Canyon to Farren Road, according to the County of Santa Barbara website. With the fire still burning, it's unclear how much damage the blaze has caused. A water treatment plant that provided water to bathrooms and facilities in El Capitan State Park burned down late Thursday night, the Los Angeles Times reported. According to California's state parks superintendent, the park and the water treatment facility had both been closed before the fire reached it. A mandatory evacuation order has the state park closed until further notice. High temperatures forecasted for the weekend could have firefighters battling the blaze in triple-digit temperatures until Tuesday. The weekend's potential heat wave has officials concerned gusty sundowner winds could cause rapid and unpredictable growth with crews already struggling to contain the fire. "Wind presents the biggest challenge to fighting the fire, as well as extreme heat predicted this weekend," officials said in a statement released ahead of Friday's press conference. California is no stranger to wildfires. 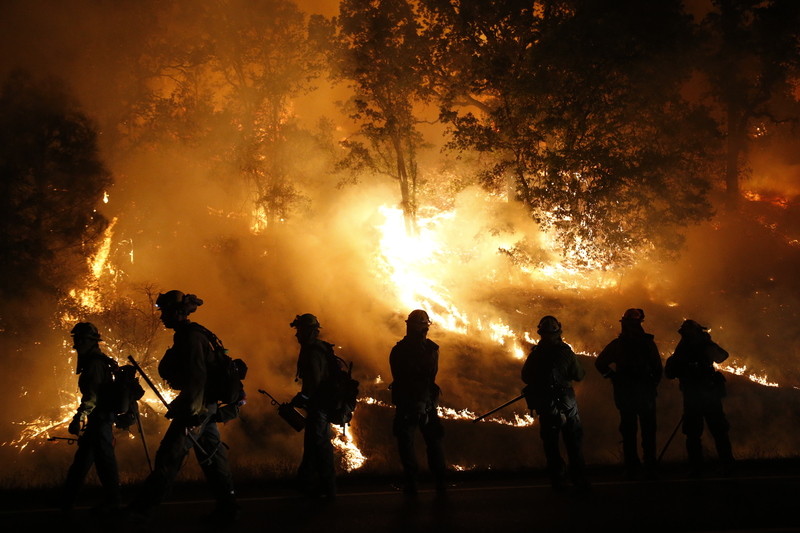 In May, the California Department of Forestry and Fire Protection (also known as CAL Fire) said it had responded to nearly 700 wildfires since the beginning of the year.